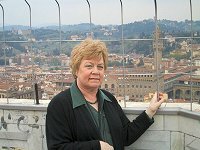 In 2002 I met an enthusiast for the city of Florence, who convinced me that a visit was not an experience to be missed. 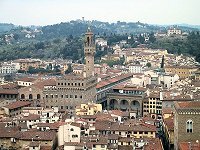 So just after Easter we had a week in Tuscany, spending most of our time in Florence with two day trips to Pisa, Sienna and San Giminagno. Our initial impressions were of the splendour of the architecture and the size of the crowds. As we left our hotel for the first time there was no doubt in which direction we should go; we simply joined the shuffling masses. 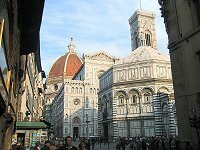 However, within a few minutes we encountered the breathtaking magnificence of Florence's Baptistry and the adjacent Duomo, the city's domed cathedral. 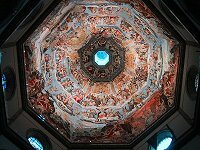 It is awe inspiring to realise that their patterned marble cladding was crafted in medieval times - the Duomo has played host to millions of visitors since the fourteenth century, and the Baptistry has stood there for over 1100 years. Dodging the beggars and illegal street vendors, we joined the queue to enter the Duomo. Inside it appeared surprisingly spartan but there are treasures to be found by the diligent, like the mural on the inside of the dome. 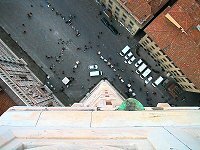 There are two vantage points for those who wish to view the city from a great height: the cathedral dome or the top of the Campanile, the cathedral's adjacent but separate bell tower. We chose to climb the 414 steps to the top of the Campanile. 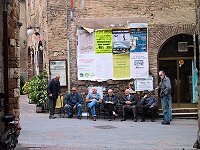 Most old cities have modern intrusions, but not old Florence. With mostly tall buildings and narrow streets the traffic is largely invisible, and the roof lines and ochre colours I imagined to be much as they were hundreds of years ago. An early view of the city from above provided a useful perspective for further sightseeing.  Distances became apparent, important when most journeys were on foot. Our guide book (The Rough Guide to Florence - excellent) spoke of scooter taxis but we never saw one. Not much use for two and, judging by the number of scooter accidents we saw in a few days, a risky option. 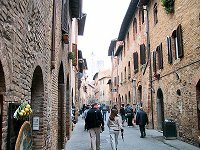 Meal times are among the many pleasures of the city, indeed of all Tuscany. After a good breakfast in the hotel and the prospect of a waist expanding dinner, our lunches were mainly Italian fast food - pizza, spaghetti, sandwiches and ice-cream. Perhaps we are more tolerant on holiday, but our lunches were always tasty, cheap, fast and enjoyable despite the numbers to be accommodated. Back home a quick snack usually seems to be either cheap and horrible or slow and pricey. Our best lunches were in the small cafes catering for the locals, recognisable because most of the customers were greeted by name. Dinner is a pleasure to be anticipated every day. We found the good restaurants were always full, so we made a reservation most days. Even some really classy places only accepted cash, not even euro travellers cheques. The latter proved useless and we eventually cashed all of them at a bank - for a price! The ATM is the best option, but with a fixed fee per transaction (£1.50 for us) it pays to make fewer but larger withdrawals. We always walked home after having dinner and never felt threatened or intimidated, except for the street cleaners with their high pressure hoses! Because of doubts about the acceptance of plastic, we left most of our funds in the hotel room safe and carried just enough to buy dinner. Unfortunately you tend to spend all you take! 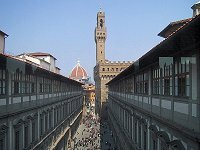 The gem in the crown of Florence is undoubtedly the Uffizi Gallery. On our first full day we saw the slow two hundred metre queue and decided to leave it for another time. But our trusty guidebook gave us a number for reservations. The following day at the appointed time we walked to the front of the queue for immediate entry - we felt very smug. Thanks 'Rough Guide'. The gallery is a feast of renaissance paintings, and it was a rare treat to see so many that I recognised from photographs. Towards the end of our three hour stint I was sated, but Elsa enjoyed every minute. Don't use the rooftop cafe - it's a rip off! Outside the gallery are the ubiquitous street performers: painters, wire sculptors, musicians and actors to name but a few. My favourite was the guy dressed to look like a bronze statue. If someone put money in his box he would spring into action and scare the life out of the poor unfortunate donor. He could stand so still on his plinth that it was easy to mistake him for the real thing. That famous Italian invention, the scooter, was everywhere. 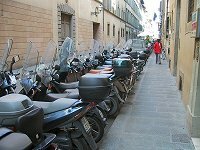 A taxi driver told us that there are 350,000 inhabitants in Florence and 130,000 scooters! They park in their hundreds at right angles to the kerb, so close together that they are hard to retrieve. If one fell over it could bring the whole rank to the ground. In theory private vehicles are not allowed in the city centre, but scooters are clearly exempt. Oh, and forget the security of a pedestrian crossing - not even the police cars stop. 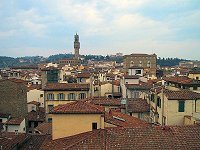 The old city of Florence is clearly an art lover's paradise, but even in the short time we were there we discovered many other attractions. I enjoyed the museum of science, where we saw among other things Galileo's telescope, Da Vinci's models, some gruesome 300 year old medical instruments and a range of life-size wax models depicting the many complications of childbirth. We spent a fascinating morning in the Boboli Gardens, offering wonderful views of the surrounding countryside. 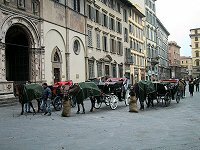 We were impressed with the general cleanliness of the city, despite the overwhelming number of visitors and the horse-drawn carriages. By the middle of each evening the garbage collectors were busy, followed by the high pressure hoses to sweep up the rubbish and keep the streets clean. The drains were sometimes a bit smelly, but what can you expect when they were probably laid down in the middle ages. My favourite piece of art was Michelangelo's sculpture of David. 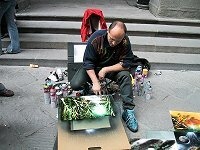 The original is displayed in the Accademia Gallery, a convenient 200 metres from our hotel. It is magnificent! Standing almost five metres high and in almost perfect condition it demands to be admired. Depicting the figure of David wearing only his sling, it shows every muscle, bone, sinew, vein and other minute details of the male form. Furthermore, it has a commanding presence that impressed even a Philistine like me. There are two life-size copies, in the Piazza della Signoria and the Piazza del Michelangelo. 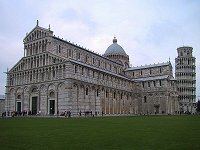 As Pisa is barely an hour's coach ride from Florence, we spent an afternoon viewing its most famous attraction. However, the leaning tower is just one of four medieval masterpieces in the Campo dei Miracoli, Field of Miracles. Despite the phenomenal number of visitors it attracts the buildings have been left unspoiled and separated from the souvenir shops and ice-cream parlours, offering the visitor a view untrammelled by modern intrusions. However, technology has crept into the cathedral; an array of electric candles that can be lit by the faithful on insertion of a euro coin. 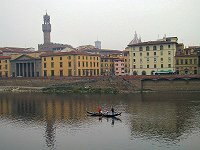 Whilst walking through Florence on Sunday morning we were surprised to see a gondola being rowed along the River Arno. However, it made a good picture. On the way to Sienna we stopped off at the delightful walled town of San Giminagno. Set on the top of a hill, it reminded me of Mont Saint Michel. Its original seventy towers are now just fourteen, but impressive nevertheless. Apparently, the height of your tower was an indicator of your wealth. Plus ca change! Many years ago I was a student at Birmingham University, which has a fine clock tower reputedly copied from the one in Sienna. Elsa sees it every day from her classroom. We were therefore both interested in seeing it first hand. The two are very similar except for a few details at the top. We also took the opportunity to explore some of the other sites, and enjoyed an excellent four course lunch for just 12 euros each (about £7.50). The cathedral is built on two levels and the final section was never completed. 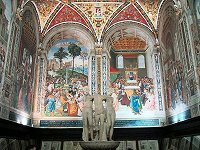 The cathedral library is well worth a visit, if only for the colourful murals depicting some of the city's history. Tuscany is a beautiful place steeped in history. We enjoyed our glimpse of what it has to offer, and the attendant delights of its food and wine. It is not expensive and most attractions offer good value for money. The locals are friendly and helpful, but the ever-present street vendors are a nuisance. Be sure to take a brolly!